Alternative and replacement fuels are making moves, according to the most recent data released by the Energy Information Administration on Monday. From 2007 to 2011, traditional fuel use dropped 7.8% to 171 billion gasoline equivalent gallons, while alternative fuels bumped up 124%. Pushed ahead by a 240% spike in biodiesels, replacement fuels took the consumption cake, with a 187% jump to 9.5 billion gasoline equivalent gallons in 2011. According to the EIA, biodiesel's boost is primarily due to the reinstatement of the biodiesel tax credit under the Renewable Fuel Standard. 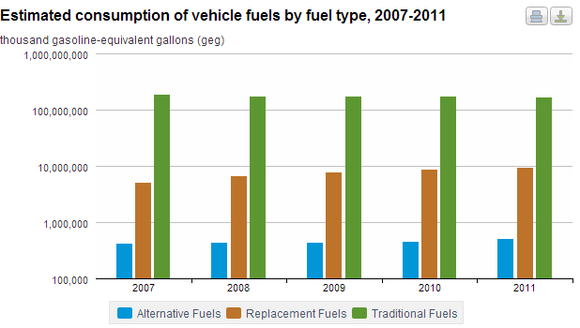 Alternative transportation fuel use jumped up nearly 13% to 516 million gallons in 2011. 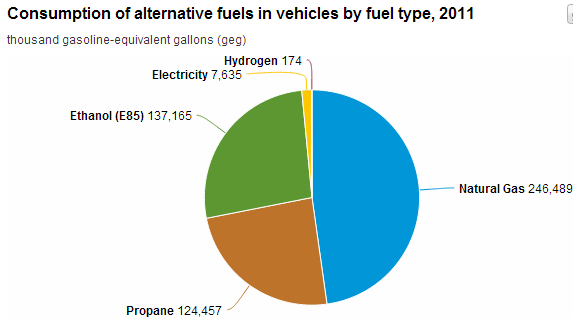 Although natural gas continues to comprise nearly 50% of total alternative fuel consumption, a new wave of E85-capable vehicles helped push ethanol use up 52% from 2010 to 2011. The article Biodiesel Use Up 240% in 2011 originally appeared on Fool.com.